Let us show you the secrets of Cala Mesquida! Mallorca is breathtaking. The abrupt inland landscapes stand in utter contrast to the crystal-clear waters of its beaches and coves, which are year-round attractions regardless of the season, offering as they do a combination of unspoilt nature, relaxation and an endless list of ways of keeping yourself fit. Today we’re recommending Cala Mesquida, one of the archipelago’s most stunning beaches, located between the districts of Capdepera and Artà. A beach that dreams are made of! 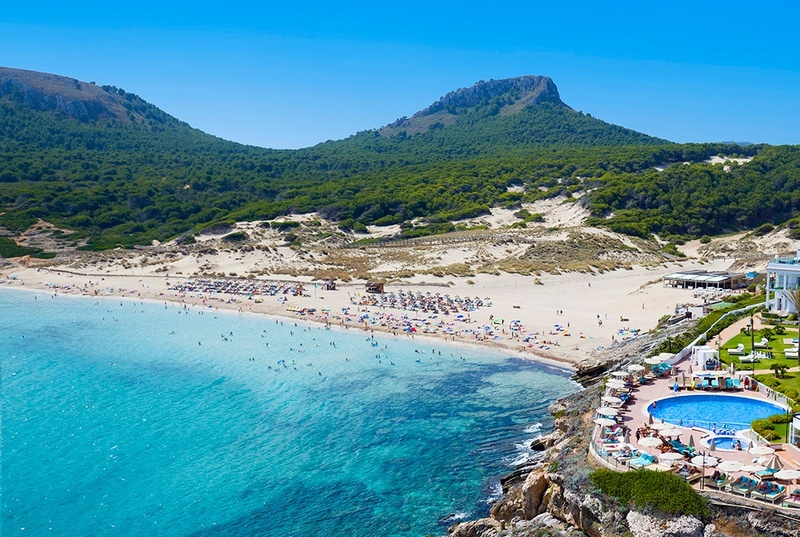 Cala Mesquida, otherwise known as S’Arenal de Sa Mesquida, is situated just 7 km from Capdepera and 15 km from Artà, on the north-eastern end of Mallorca. It features white sand, rocks, dunes and typical Mediterranean vegetation and, as home to a large colony of seagulls and cormorants, you’re likely to spot a wide range of bird species. Cala Mesquida encapsulates the contrasts that you can find throughout the island: there are extremely peaceful, semi-virgin areas, while elsewhere there is a tourist hub that has flourished for decades. Its importance on Mallorca is such that it has been granted protected status as a Natural Area of Special Interest. Reaching the bay by car is child’s play, so it’s ideal for visiting with family or friends. It has an easy bus connection to two of Mallorca’s most beautiful towns: Capdepera and Artá. You’ll find all manner of services on offer at Cala Mesquida: sunbed and sunshade rental, a pharmacy, bars, restaurants, hotels and an outdoor shower area. If you’re into water sports, you might want to have a go at snorkelling, surfing or pedal boating, all very popular activities in the bay. Naturism is permitted towards the eastern end, if you fancy baring all. And if you’re a golf-lover, just a stone’s throw away there’s Capdepera Golf, a wonderful 18-hole course boasting all the facilities you need. If you’re interested in visiting Cala Mesquida, we have accommodation options for you! Hotel VIVA Cala Mesquida Resort & Spa is located just next to this spectacular beach, and the views from its rooms are consequently stunning. But the views aren’t the only thing! The hotel boasts a wide range of Mallorca restaurants catering to all types of taste, a variety of swimming pools, two large-size jacuzzis, sports facilities and multiple activities for the youngest members of the family. It’s perfect, whether you come as family holidays or to sports holidays! What’s more, if you’re coming for a mini-break with your partner, you mustn’t miss the Balneum Spa, where you can relax and pamper yourselves both indoors and outdoors thanks to the wide range of wellness treatments on offer. And did you know that in all the treatments we use artisan, 100% natural products? Visit Hotels VIVA for more information. Foodies: This hotel is your heaven on earth! Bistro El Patio: with drinks and breakfasts available at any time. Restaurante Las Dunas: with sandwiches and drinks always at the ready. Caprice buffet: for those who like to feast their eyes. Mirablau: offering Mediterranean cuisine right by the beach. Bar Palapa: in the swimming pool, for those who love finger food. What are you waiting for to come and discover Cala Mesquida and stay at our fantastic VIVA Cala Mesquida Resort & Spa? It won’t disappoint you!